Despite the Internet’s best efforts, Star Wars: The Force Awakens will undoubtedly have a handful of really great surprises to give fans when it comes out at the end of the year. And now it’s being tossed around that one of those surprises may have something to do with a female Stormtrooper trooping around the universe. Could the male-leaning franchise actually be bringing in a woman for its iconic cloned army? The rumorish news places newcomer actress/musician Amybeth Hargreaves as the first female Stormtrooper, and it comes from her resume on Spotlight UK, which had a 2014 listing for her role as a “Storm Trooper” for Disney and J.J. Abrams’ Star Wars. That particular listing has since been removed, probably not long after fanboys first heard this highly intriguing factoid. Here’s a screenshot of the unaltered resume, thanks to JediNews. The implications of having a female Stormtrooper aren’t massive on a narrative level at this point, considering we’ve already seen actor John Boyega donning the Stormtrooper suit. And we’re not quite sure what his role is all about either. It does seem probable, though, that the Sith have stopped using only the cloned DNA of Jango Fett for their blaster blasting army. BBC Entertainment Correspondent Lizo Mzimba had an interesting question about what Hargreaves’ role will actually be, even if it’s confirmed that she is a Stormtrooper. 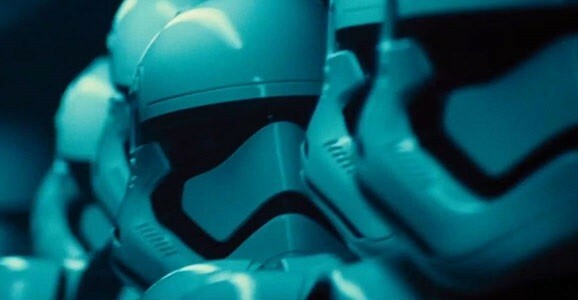 Wonder if Stormtrooper in own right, or perhaps a filming double if, as rumoured, @loveGwendoline plays a stormtrooper in Ep VII. Gwendoline Christie, but if she’s a stunt double of some kind, that height difference won’t matter as much. But it also seems weird that they’d get a relative unknown to take a double job that has its own mini-industry. That would also mean that Christie is playing a Stormtrooper, which would confirm some early speculation. In the end, we’re left wondering these things while muttering to ourselves and bouncing off the walls of these endless padded rooms. Star Wars: The Force Awakens debuts in theaters on December 18. Do you guys hope to see Hargreaves’ face at some point?